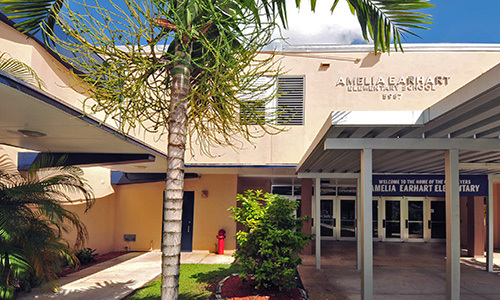 Amelia Earhart Elementary is an outstanding institution for educating students, especially those entering pre-kindergarten or kindergarten to begin their academic careers. We invite you to take advantage of the wonderful learning opportunities available here at Amelia Earhart Elementary. There are a variety of educational programs and clubs that peak the interest of our students and parents. We enhance students' academic performance and develop students' life skills for functioning independently in our information age by implementing a continuous cycle of analyzing students' academic and personal needs, making data-driven decisions and collaborating with parents and the community in a win-win partnership. Our dedicated teachers are continuously attending staff development to improve instruction and increase achievement for all of our students. In particular, we are focusing on Common Core (critical thinking skills, collaboration, communication, and creativity). The Amelia Earhart Parent Teacher Association (PTA) is hard at work planning many educational and exciting activities for our students. Our PTA supports the needs of the students, staff, and educational programs at Amelia Earhart Elementary. Please be sure to do your part by joining the PTA. We are so fortunate to have such an involved community! Go Highflyers!